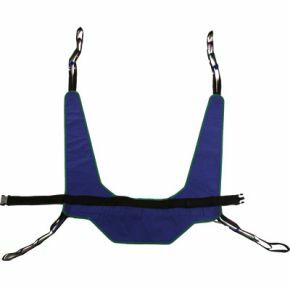 Within the Invacare® sling range there are two toilet transfer slings available; with or without head support. Both models come with a belt for increased support around the body and for safe positioning. The Dress Toileting Sling is suitable for those who have limited mobility. The model with head support is designed for users who also have reduced head control. The Dress Toileting Sling is suitable for those who want to be able to dress and undress during the toilet transfer. It is used for seated to seated transfers and is very easy to apply.